Happy November! Our November has rang in with a bang- a cold and a double ear infection. Whomp whomp. I am hoping we have gotten all the nasty sickness out of the way so that we can enjoy the holiday season. I LOVE this time of year!!! Here at the Primary Peach we are celebrating the month of November with tissues and cough syrup a cornucopia of teacher tricks! Each day, a different author will share a tip to make YOUR life easier! Yahoo! I love readers theater. I used it often in my classroom. It enhanced fluency and confidence in my struggling readers. It made complex text easier to access due to the repeated readings. AND it is fun! What is not to love!? I have actually written about it a pretty good bit in my own blog here and here. You know how your schedule can be all wacky between now and Winter Break? There are tons of special events, assemblies, and celebrations. I loved to use reader's theater during the "odd" weeks when either we would be off a few days ( like for Thanksgiving break) OR the learning was so interrupted from the series of special events (which was pretty much ALL of December!). Readers theater is a GREAT way to still teach and have meaningful lessons, but can be done in small bits at odd times. I liked to choose *at least* two scripts and divide my class in half. I tried to find scripts with at least 10-12 parts in it. This was for two reasons: first, the group performing would always have an audience (the other half of the class) and secondly, finding scripts with 20 some-odd parts is VERY hard! 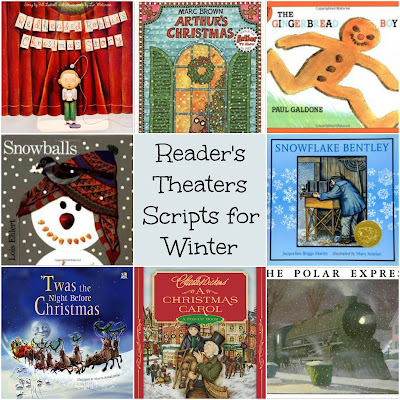 Looking for some FREE Thanksgiving and Fall Reader's Theaters? Check these out below! Looking for some FREE Christmas and Winter Reader's Theaters? Check these out below! Are you looking for some more FREE scripts? Check out these sites- they have tons! There are lots of ways to take this tip! Let's talk about the actual teacher prep. I liked to have all the scripts run off ahead of time, ready to go. I highlighted ONE character's name on the top of the script. I did this so when I choose Suzy to be the part of the Turkey, the Turkey was already highlighted. I DID NOT highlight all the scripts parts for the Turkey throughout the readers theater- more about that in a bit. I preferred to use reader's theaters that are actual children's books. I did this because before ever introducing the reader's theater script, I could read aloud the book and model oral fluency. I also used this time to think aloud and go over vocabulary. It was a total win-win! After reading aloud the book, you may be tempted to go ahead and assign parts. WAIT! This is an awesome time to get students even more familiar with the text and practice their fluency. Break the class in to small groups of about four. Have the small groups read the script in a circular manner. Instead of assigning parts, students will read the next line when it is their turn. Then, at the end of this time you can assign parts. You can do this randomly or assign by choice. I did it both ways with success. AFTER all this, then I gave kids the highlighters and had them highlight their parts! Practice the scripts with an "audience," which can simply be the other half of the class. I also have the groups practicing AT THE SAME TIME! I know it sounds crazy, but they usually don't mess around. They are so motivated, because it is fun! We do somewhat rearrange the chairs, so that there are two long lines of chairs (one of each group of reader's theater). This makes it easier for me to keep my eye on them, just in case ;). One of the best things about reader's theater is that you can make it a super big deal...or just an itty-bitty deal! It ALL works! Your students could perform for a younger grade level or class. My kids always LOVED this. Some years we also did a Family Feast. We invited families to attend the reader's theater performance. Each family bought a traditional dish from their home to share with the class. It could be something like rolls or cranberry sauce, or even a dish from their native country. We always had a fabulous response! You can read more about that here AND get an editable copy of the letter we sent home! I hope this gives you some ideas to "fill in the blank"spaces of time during the holidays! Like this tip? make sure to come back tomorrow for a NEW tip from a different author ALL month! What a great idea! I am going to try reader's theater for the first time after reading this post!